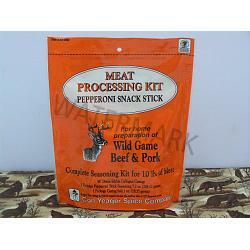 Snack stick kits make great gifts for the hunter in your life. Give him something the whole family can enjoy. A family event making snack stick is fun and delicious. Our kits are great because they use only the best ingredients and package their products so they are ready for use by the weekend butcher. 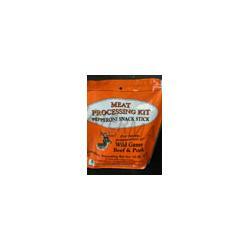 Each kit comes complete with seasonings, cures, casings (when needed) and detailed instructions for processing. The Pepperoni Snack Stick Kit contains Seasonings, Curing Salt and 46' of 24mm Edible Collagen casings to process 10 lbs. of meat. Just the right amount of pepperoni flavor makes this one of our most popular kits. Gluten Free. Made in the USA.